Light stimulates the perception of things. The reflex of electromagnetic radiation delves into our deduction of the world through a mechanism of filtration done on the chromatic light spectrum. Reality, then, reveals upon our eyes and from these to the brain, distinguishing shapes and physical space. In Art history, from Impressionism onwards, the theme of light is faced as a field of survey in order to explore what is invisible in objective reality: that is the principle of a research that makes visible the shape beyond the naturalistic glance, which does not describe but instead suggests. Space also becomes the area for aesthetic contemplation, continuously in relief of both retina and mind, depicting the subjective evaluation of things, as it is subjective in every man the ability to perceive the lightsome spectrum. Art then starts exploring the invisible, opening an era of enlightenment of other realities, lived inside our psyche, physically parallel to the real world, and credible as well. It suddenly happens, that the matter disappears leaving behind the reflex of itself and we cannot see things dissected by physics but described by sensations, bearing the most authentic qualities of our self-being. Impressionism, though, is the beginning of an era where the margins of the shape (the straitjacket enclosing us in the cage of finite things), are progressively diluted and eventually blended in a continuum along with the particular and the whole, space and movement, spectrum of colors and spectrum of sensations, objects and thought of objects, and despite the early spur inducted by the impressionists is purposely far away from any lyrical abstraction, the ignited process is irreversible and goes beyond their extents. The figures moulded/reflected by light seem to make immediately visible every light vibration that crosses the surface of objects and of every living being, increasingly mutating the pictorial expression from being physically recognizable to being physically perceived, leaving a margin that dangles between the perception of the known and the sensitive world and another universe, which continuously transforms through our glance. In that specific moment there is a radical shift towards the fruition of painting: the viewer is called to watch and not just look. Watching, instead of looking, is like stroking things, perceiving the consistence of atoms, the specific volume. Looking, instead is recreating the same things through a judgment juxtaposition and subjective imagination, which makes visible to our eyes the portion of reality they are not able to see. An acute feeling, a creative act, that lets figures emerge beyond the natural dimension. Raffaele Cioffi draws from the anti iconic, post analytical traditions, but I would say he is more a “trans-analytical” painter, who uses his skills, well registered in its phases, as a tool not as a purpose, eventually free to interlace topics and elements to fulfil his research. He is not worried about telling a story, rather he prefers to put the viewer in a condition to enjoy an experience either poetic or perceivable, not led by recognizable elements of a common path but stimulated by the effects of the pictorial device and by the machine of intent ruled by the method. I will not linger on the obvious comparison somebody would draw between Cioffi and other artists using light in a similar way in their work, such as Dan Flavin or James Turrell, because I do not think these kinds of events, spatial and tridimensional, can be transported to painting, despite Cioffi shares the same field of survey and outcomes. Similarly, it is not enough to relieve paintings consisting in colorful crosshatches to associate them with the “Color Field” school and everything related to that movement. Although we can find some elements typical of Barnett Newman in several late paintings of Cioffi (the vertical coats of paint), as well as the composition made through surfacing spots reminds us of the strong influence of Mark Rothko in Cioffi’s paintings. In the same way, the sequence of spatulate found in the series “Verso l’Orizzonte”, “Impronte” (2009), is openly inspired by the variations of Gerhard Richter, who is loved by Cioffi because of the issues the German artist faces in his works: the principle of a painting, loyal to its essence, layered and opened, which “represents the marvelous” (Gerhard Richter – Painting, directed by Corinna Belz – 2011), through an oscillation freed from styles and from critical-ideological dogmas. To understand the road chosen by Raffaele Cioffi, we must travel back in time, to seek a genesis not related to recent topics, easily detectable among the usual categories. In my opinion, the impressionist school undoubtedly influenced the crosshatches of the latest works by the Italian artist as it happens in “Smarginatura 2” or “Porta Scura”, exhibited in the show. Claude Monet vaporizes the shape diluting every element in a fragmentation that avoids the “subtractive synthesis”, a juxtaposition of colors reducing the limpidity of light, thus escaping more and more from the physical reality of realistic representation based on volume designed, realizing in the same time that light is the amalgam of everything. 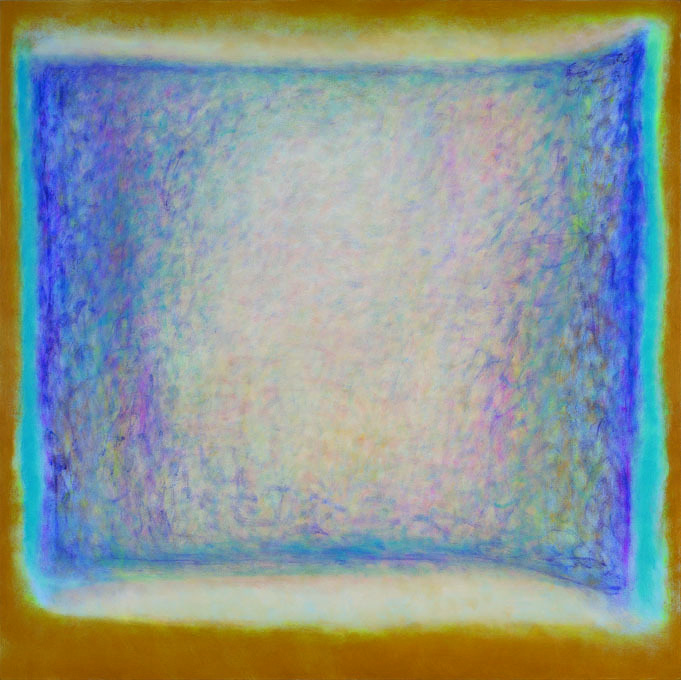 In his latest works Cioffi does not chase the strict research of crystalline brightness made by Monet, but uses the tools exploited by the Impressionists actualizing their experimentations by recurring to contemporary dynamics of contrast eventually sharing a similar scope with them: “to seize” the totalizing pictorial image. Cioffi has also an excellent knowledge of painting techniques, and since his remotest work he demonstrates that the ideal technique to let the color vibrate is through thin and thick textured pigment strokes. Indeed he lays down a dynamic field between the chromatic porosity of fibrillating coating related to the single color interventions (duly perceivable), and the installment of proto-forms appearing/emerging as mysterious prints with no elements related to iconic nor symbolic nonetheless they justify the relation formed among color, light and the “movement of everything”. The first aniconic paintings made by Cioffi feature threads which become creases as the vertical rhythm increases along with its vibrations, which however do not compromise the density of the levels of color. Successively, his compositions approach the abstraction: the creases amass, lighting up strings of vertical or horizontal neon colors thus illuminating the perimeter and underneath through orthogonal shapes, often with discordant effects. As years pass by, the sense for a homogeneous synthesis in the composition based on the contrast between halo/string has been focalizing over the light that instructs the color and the shape. The exhibition “Vapors of light”, features works opening a new chapter for the path of Cioffi: here we find unseen experimentations along with elements previously inquired, graciously intertwined and accompanied by a statement of intent more harmonic and defined. The works exhibited prove a decreasing visual complacency, fleeing from captivating solutions and shying from the cliché of the “pictor optimus”, indulging, differently from before, the technical exercise in more refined and more mature extents, where the promptness of the gesture marks the generating code of the whole composition. In my opinion the purpose of Cioffi is clear: loosely using the neo-impressionist technique applied through the sense of exact and well synthesized pictorial approach, proper of Analytical painting school and through the lens of informal paintings experience, he actualizes his composition recurring to a contrast procedure which leads to a sensorial, visual and intellectual disturbance. The tensions created by sign and colour are immediately understood by looking at the, nervous and chaotic, pigment traces putting out an effect of dense vapor, almost oily, similar to the principle of the thin-film interference or the distortion by different optical paths (such as the effect of oil in the water), which draws chromatic iridescent reflexes. The canvases are covered by vapors of colored light where, sometimes, proto-geometric forms are unveiled, unstable and deformed at the perimeter, producing a mechanic of interference and impression of slippage on the surface of the support, often with jarring results. The color traces, presenting a strong contrast on the edges of the canvas, are reflexes attempting to tarnish the perfection, describing thin disturbances, almost devious signals. His works are passages seeming to absorb us through baffling space-time tunnels as we see in the “Porte” series, it surrounds us with chromatic nebulae which dissolves the light as it happens in the works called “Aloni”, or even confronting us with the sense of a reality unfolding, “detaching” from the canvas as it happens in “Smarginature”. In each of these new works, Cioffi expresses from one side a strong “impressing” will that conducts the sense of the work, its communicative shell, from the other promotes to stimulate the viewers’ emotions, suggesting a regular and continuous, almost hypnotic pulse then broken through misleading brushstrokes. The principle: believing in painting as an insurmountable mean of deliverance from manipulations caused by linear thought. The goal: awake the “sleepers”, actually all of us, mesmerized by the world of objects.